Amid the Boxing Day sales and in the middle of the aforementioned "staycation", A and C decided to head to Oxford Street (brave or stupid - we're not sure). After picking up a few bargains, we ended up feeling so stressed with the masses of slow-walking shoppers that we needed to retreat to somewhere quieter. Wandering down towards Embankment, we stopped in our tracks on Piccadilly when we saw Kahve Dünyası - a new venture that's just opened its first store in London. Immediately drawn to the obviously Turkish name, A commented that he thought he'd seen a branch or two in Istanbul and Ankara while we were travelling around Turkey last year. A quick Google search showed that his hunches were right - there are something like 100 branches just in Istanbul alone (C then felt a bit silly for not having noticed any). After success in Turkey, Kahve Dünyası picked London as its first location outside its native country: a privilege for Londoners, for sure. Located centrally on Piccadilly, it looks a little like a French patisserie from outside - glass windows show cabinets full of fresh handmade chocolate truffles, marzipan, macarons and little chocolate statues, as well as other indulgences like a creperie, ice cream parlour and gooey chocolate fondues. Inside, it's large and modern, with wooden floors and bright lighting; in its design, it's actually quite reminiscent of many of the modern cafes you find in Istanbul. It may seem a whole lot like a French patisserie (we suspect a deliberate attempt to appeal to the London masses, as we doubt how many macarons you're likely to find on the menu in Ankara) but glimmers of the strong Turkish influence are visible here if you know what you're looking for. First off, the drinks menu: Turkish coffee sits proudly amidst the other beverages, and after sampling it A has declared it undeniably the best he's had outside of Turkey itself. The flavour of the blend here is exceptionally smooth, and they make the coffee properly: you will find all the grinds at the bottom of the cup, rather than floating in the drink itself. Sadly, the latter is all too common in London, as A found out later on in the staycation. For keen home brewers of Turkish coffee, they sell coffee and coffee sets here too, and they're stacked up around the place doubling up as authentic decor. There are other Turkish influences on the menu here too, albeit a little more discreet: there's a type of Turkish delight available, and mastic flavour ice cream is quite prominent (for the uninitiated, mastic is huge in Turkey, being one of the most popular flavours of Turkish delight and is also used to flavour milk pudding and other desserts). 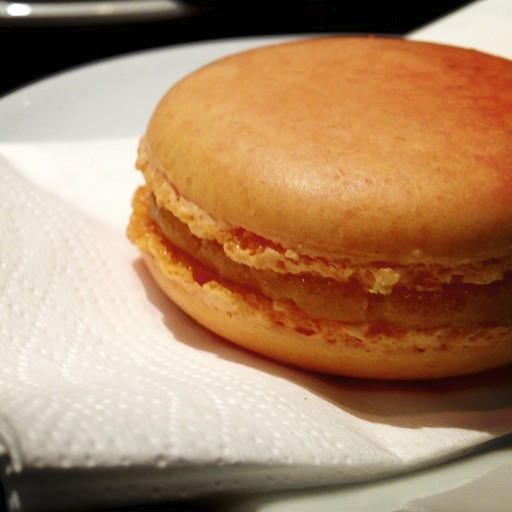 For the most part, though, this place does double up as a French-Turkish patisserie, which suits A and C very well. 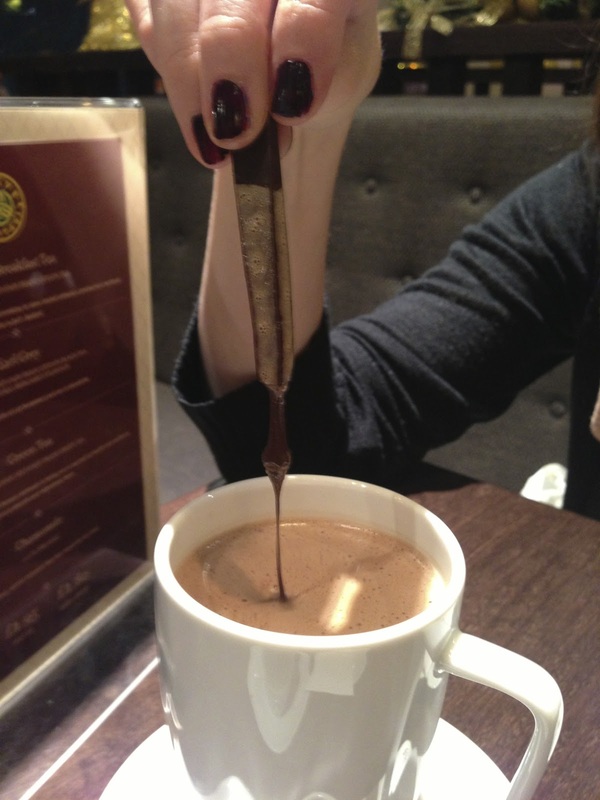 While A sipped on his Turkish coffee, C opted for a banana hot chocolate milkshake, which to her delight (there might have been a squeal) came with a chocolate spoon. 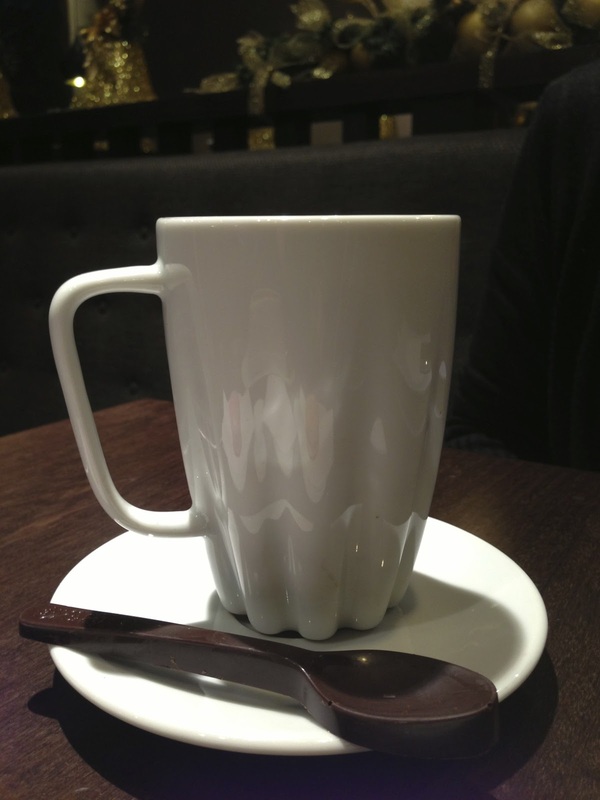 The idea is that you stir the hot chocolate with it, and then as it melts let it drop into the drink. As you can imagine, the end result is an extremely indulgent, rich hot chocolate - absolute perfection for someone with as big a sweet tooth as C.
To eat, A and C both opted for a couple of macarons: we hadn't planned to eat anything as we were going out to dinner later, but they looked just too good to resist. We might have ended up having a couple each: between us, we tried apricot, coffee, lemon and rose, and all were excellent. Pushed for a favourite, we both agree that apricot is the hottest tip in town. If you're around Piccadilly - or, honestly, if you're anywhere around central London (this place is good enough to make a journey for) - pop into Kahve Dünyası. Whether you opt for French viennoiserie or Turkish coffee, you'll be in for a brilliantly indulgent treat, and you'll want to come back for more pretty quickly. Trust us: we've been twice in a week.